Today Holy Mother Church celebrates the feast day of St. Maria Goretti, a martyr who died at 12. Her story is a simple one. Alessandro, a young man, came to Maria one day and tried to force himself on her. She refused, and told him it was a sin and that such sin is mortal. Angered by this, he pulled out a dagger and stabber her. She died shortly after the attack. Alessandro was imprisoned, and spent quite some time with no remorse. Until one night, when Maria appeared to him in a dream. It changed his life: he began to pray, and this made him recognize the evils he had committed. It is said she struggled in catechism; education in the faith did not come easily for her. But to look at her story is to see a woman whose faith was rock solid. Alessandro, her murdered, was truly converted because of her! I bet she would tell you that this mere fact made her death worthwhile. Alessandro attended the canonization of Maria, who became a saint in 1950. It is reported that he was in tears, on his knees, in joy and sorrow. 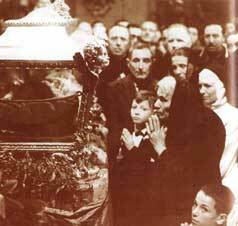 I think, but do not know for certain, that this is the very man in the photo at the top of this post–a photo from her canonization.